The recent surge of Virtual Reality has, unsurprisingly, leaked into tattooing and opened new avenues of body modification and self-expression. A few creative artists have found a way to combine ink with animation – creating the first generation of virtual reality tattoos. This integration would allow tattoos to move (think of the moving pictures in Harry Potter but on your biceps). The field, largely referred to as bio-hacking, is a combination of body modification and technology. On first glance, it seems that these niches could never intersect when in reality they work quite well together. The first animated ink was created when Karl Marc, a Paris tattoo artist, streamed the event on Facebook. He worked for hours to recreate a QR code inside a blooming flower that was tattooed on a volunteer’s chest. QR codes are largely used in magazines and newspapers, which can be scanned and decoded by smartphones. The phone then searches for the embedded website and plays back a video that depicts the finished design, revealing an animated singer. There was a huge amount of pressure on Marc while tattooing because, if even one box was out of place, a smartphone wouldn’t be able to read the code. Adding to the pressure, Marc live-streamed the event and allowed people to comment on his work while he was still installing it. Luckily for Marc and his brave volunteer, the experiment was a success – making it the first animated tattoo on record. In the video above, you can watch as the design comes to life through a smartphone and a small character pops out of the flower and begins singing. This breakthrough opens up new doors for body modification and the possible integration of technology and the internet. 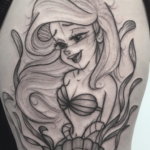 It also gives tattoo enthusiasts more freedom for self-expression since websites can easily be changed if you ever grow tired of a singing character.